In this article, a treasury policy is defined as a company’s response to a financial risk such as FX, interest rate, commodity, counterparty, liquidity or funding risk. 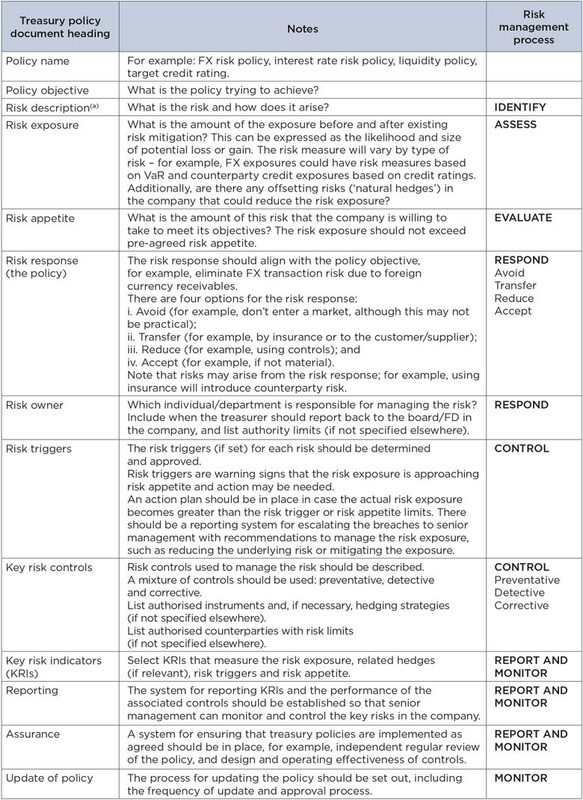 The risk response is set out in a ‘treasury policy document’, which should include details on the cause and potential impact of the risk, the company’s ‘risk appetite’ for that risk, the response (for example, hedging the risk using derivatives), the controls to manage the risk and the system of risk reporting. This article provides general guidance on producing treasury policies based on relevant advice in current international risk management standards, and includes an example checklist that could be used when creating a treasury policy document. The process described is general, so can be applied to companies of all types and sizes. Use existing risk management frameworks and systems in the company, including risk terminology, risk measures (for example, Value At Risk – VaR) and policy templates (if they exist), to ensure policies are produced on a consistent basis across the company. Take into account the company business profile, financial position, corporate strategy and economic environment to identify the key risks, identify potential offsetting risks (‘natural hedges’), set the risk appetite and set the risk response. A company’s risk appetite is the amount and type of risk a company is willing to take to meet its objectives. It is a key component of a treasury policy document and depends upon a number of factors, including the risk capacity of the company (how much risk the company can bear), shareholders’ and management’s attitude to risk, and the economic and competitive environment. Adopt a standard risk management process for each risk, for example: identify, analyse (likelihood and size of risk), evaluate (compare risk exposure with risk appetite), respond, control, report and monitor. Assign ownership and accountability for the management of each treasury risk and associated treasury policy. Review the risk management process at least annually or when there are major changes in the company profile, corporate strategy or economic environment. Additionally, there should be a process to identify ‘emerging risks’, which may not be an immediate threat, but could be more significant in future, for example, climate change and automation. The following table provides a checklist for producing a treasury policy document. Although the components set out in the table are likely to be included in most treasury policy documents, the actual contents, structure and form of the policy documents will vary from company to company depending on the type of company and its risk management framework. Examples of uncertainty include potential changes in market rates, regulation or credit quality of counterparties.